At Great American Smiles in Austin, our mission is to help keep your smile healthy and restore it when necessary. This can be done through fillings, implants, or dentures, and no matter what the best approach is, you’ll receive outstanding care every time you’re in our clinic. If you feel that dentures are the best option, or our dentist recommends them, we’ll make sure the proper dental appliance is created to fit your mouth. We want your smile to shine for years to come! Dentures are dental devices that are often removable, but there are options that can be fixed to the jawbone. If you’ve lost teeth because of decay or injury, dentures might be a good option for your mouth. 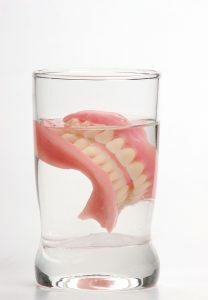 It can be uncomfortable to speak and eat with missing teeth, and dentures can restore your smile and your confidence. Dentures can also help fill out your facial features and keep your smile looking natural. When fitting your mouth for dentures, our dentist will take precise measurements of your gumline and jawbone to make sure the appliance is appropriately sized. It may take a few weeks for you to become accustomed to your dentures, but your mouth will soon learn how to keep them in place and how to talk and eat normally. Properly cleaning your dentures will also help with how they fit, and you’ll need to be sure to continue good oral hygiene for your gums, tongue, and the roof of your mouth. Our clinic can make and fit dentures for both your upper and lower teeth, so if you need to have all of your teeth removed, you won’t have to worry about the state of your smile. Contact us today to learn more about all of our dental services!